For those not wanting to go stand in line... Target.com has Dr.Mario's. Just grabbed one. So I walk to electronics, pick out the Batman bundle out the case. We go to the register and I give them the kmart ad and ask for a price match. They were stunned. They said unfortunately they couldn't do the price match because it wasn't the exact same system since it was just the vanilla system on kmart. 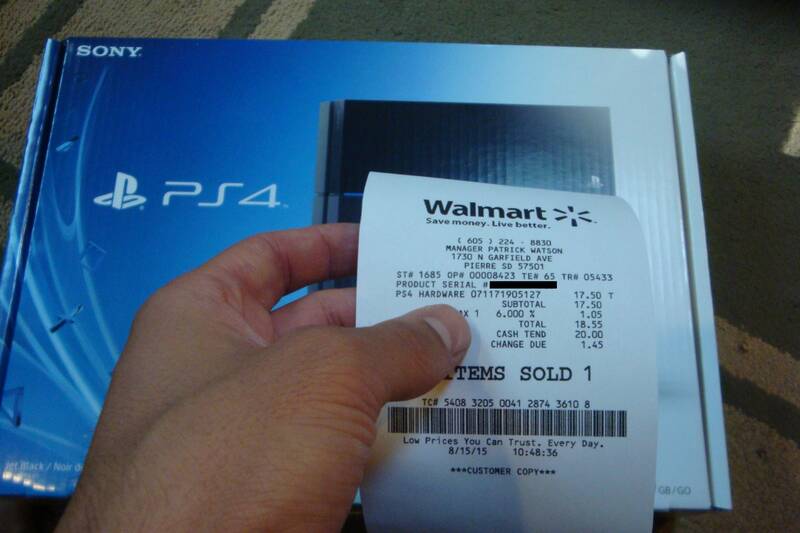 I ask if they can check in back for just the PS4, no bundle. The associate walks out glowing like Jesus Christ himself with this box in his hand, claiming it must have been overstock from last black friday. They call for a manager. That manager then ends up calling for a manager. They have a huddle and to my surprise they end up doing it. 2 managers and 3 electronics associates stare as I walk away from the counter, PS4 and receipt in hand. You sir, are a CAG Hero. That's a good deal, right? It comes with 2 extra games, so that's pretty cool. The last two hundred posts: "I walked into Gamestop today and ordered the 3pack." Fascinating, thanks guys. Keep posting that! "I visited this forum page this evening and witnessed a jackass." I walked into Gamestop today guiz and ordered the 3pack. ......I walked into Walgreens today after and purchased a 3 pack of pepto. Early rumors suggest that Bowser JR will be a Toys R Us exclusive and Dr. Mario will be a Target exclusive. Mr. game and watch, ROB and Duck hunt dog being part of a gamestop exclusive retro three pack (with them getting a single release at other retailers). Zero suit Samus, Ganondorf, Olimar and Mii 3 pack being available at all retailers. Again these are rumors as of now. Hot damn I wish they'd do a remaster for that game. That's one game I would slap down money for on day one!! #12835527 Dragon Ball Xenoverse (PS4/X1) $39.99 (GCU $31.99) via Best Buy. Really good DBZ game with RPG elements. Bought it at launch, surprised it took this long to go down to $40 (or $32 with GCU). I agree. I was really amazed with how well the game turned out. It's a lot of fun to play, especially if you have friends. The RPG elements and the large list of moves and unlockables gives you a lot to work towards when playing the co-op missions. I really hope they make another one. Reminds me of Trine play wise, feedback on how you like it would be cool cause I'm debating that as well. Ended up testing the game out a little while ago when I had some down time. I'm going to give it a pass... it's not for me. It's a brawler game that feels like it has touches of Smash combined with a bit of Playstation All Stars. Not my cup of tea. #12832036 Newegg Celebration Sale Tuesday 7/28/15 - ONE DAY ONLY! #12829630 Newegg Celebration Sale Tuesday 7/28/15 - ONE DAY ONLY! After all of these "Super awesome omega unbelievably fantastic XL" events we've had lately, I have to say that I'm reaaaallly looking forward to those deals on Windows '98. You really must be trolling with this. A sub to Game Informer justifies the $15 difference at Best Buy? LOL. You using the membership 2-3 times tops would pay off your sub. Some math goes a long way. 3 $60 games would save you $36 on them for the $30 membership. What the are you even getting out of a PUR membership then? Best Buys used prices are better/the same as Gamestop, have more B2G1 free. Just stop posting and instead read and learn alittle more. People like you shouldnt say anything, just observe cause you are out of your element. BTW, its $15 a year for GCU, just like PUR. Little off topic and more than likely disappointment, but a 'Cyber Monday' sale starts tomorrow at BB. IN FOR 10 COPIES OF SKYLANDERS GIANTS!!! HUZZAH!!! I can see the pictures. I'm currently on my desktop though. Great Lot. Seeing that Banjo Kazooie hit me with some Nostalgia haha. I sunk so much time into that game. On a side note, it's one of the many reasons I'm hyped for that Rare Replay game . If you need some cheap, unboxed amiibos, the gamestop 50% off three preowned gaming figures is still live online. If only they had more used Amiibo available for shipping :(. I would've gotten Mario and Peach, but already have the other 3 opened.